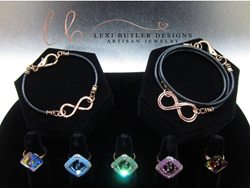 Lexi Butler Designs, in association with The Artisan Group®, will introduce its Swarovski Crystal and Copper Rings, Men’s Leather and Copper Wrap Bracelets and signature Copper Wire Rings to celebrities and members of the press at GBK's 2016 Primetime Emmys Celebrity Gift Lounge, taking place September 16-17, 2016 in Los Angeles, California. My Copper Wire Rings are made to order. They have a rustic hammered finish that complements a variety of looks. Lexi Butler Designs (http://www.LexiButlerDesigns.com), in association with The Artisan Group®, will showcase on display its eye-catching Swarovski Crystal and Copper Adjustable Rings and on-trend Men’s Infinity Leather and Copper Wrap Bracelets at GBK's 2016 Primetime Emmys Celebrity Gift Lounge. The by-invitation-only event takes place September 16-17, 2016 at an exclusive location in Los Angeles, California. Designer/founder Lexi Butler will also be gifting 100 of her signature Copper Wire Rings, which will be included in The Artisan Group’s sought after celebrity gift bags. Lexi individually handcrafted each ring using heavy gauge copper wire. The rings are simple yet beautiful, making them versatile for many occasions. They are also adjustable one size up. Recipients will find their rings in an elegant silver ring box, nestled inside a ribbon-tied muslin bag. Lexi’s display piece includes three adjustable Copper Beaded Bezel Swarovski Crystal Rings, one each in Amethyst, Aquamarine and Chrysolite, and two adjustable Swarovski Crystal Rings in Crystal AB and Volcano. The Double Infinity Men's Leather Wrap Bracelet and Hammered Infinity Bracelet reveal how with skill and inspiration the pairing of timeless materials like leather and copper can result in a distinctive and classic lifetime piece of jewelry. Both gifted and display pieces are available to purchase online at LexiButlerDesigns.com and Amazon Handmade. Lexi was born and raised in Germany as part of a jewelry-making family. In 1996 she immigrated with her Iowa-born husband to Montana. In 2007 she obtained her U.S. citizenship and in 2008 built her first website. In 2014 she launched LexiButlerDesigns.com on Shopify and now has five national and one international sales representatives who purchase and sell her work. By the time she was 20, Lexi had received her journeyman’s degree in goldsmithing and jewelry design, having completed a 3 ½ years apprenticeship in her father’s company. Lexi Butler worked side by side with her father for 10 more years. Since then, she has combined foundation skills in metal work with self-taught techniques like bead weaving and wire wrapping to create original designs that stand the test of time. Lexi says the all-time customer favorite is her shank button rings. “People just love the sparkle and simplicity yet uniqueness of these rings. They’re also very affordable.” Customers also look forward to her seasonal lines; the company recently launched its Autumn 2016 Collection, which includes rings, bangles and pendants in gorgeous fall hues. Lexi finds herself inspired by nature walks and hikes up in the mountains. She lets the ideas develop in her head and then sits down to create what she sees in her mind. Lexi Butler Designs is available online at LexiButlerDesigns.com and earthoilsandcopper.com, and on several handcrafted marketplaces, including Amazon Handmade and Etsy. To learn more about Lexi Butler Designs, contact Lexi Butler by email using the Contact button at the top right of this press release. Become a fan on Facebook, Twitter, Pinterest and Instagram. Neither Lexi Butler Designs nor The Artisan Group is in any way associated with The Academy of Motion Picture Arts and Sciences, The Hollywood Foreign Press Association, MTV, or The Academy of Television Arts and Sciences. Lexi Butler Designs (http://www.LexiButlerDesigns.com) offers a unique and personal blend of jewelry, accessories, awareness jewelry and gifts designed and created by artisan Lexi Butler. At Lexi Butler Designs, it's easy to choose from the best affordable handcrafted jewelry according to your individual budget. Lexi is a proud member of by-invitation-only The Artisan Group®.